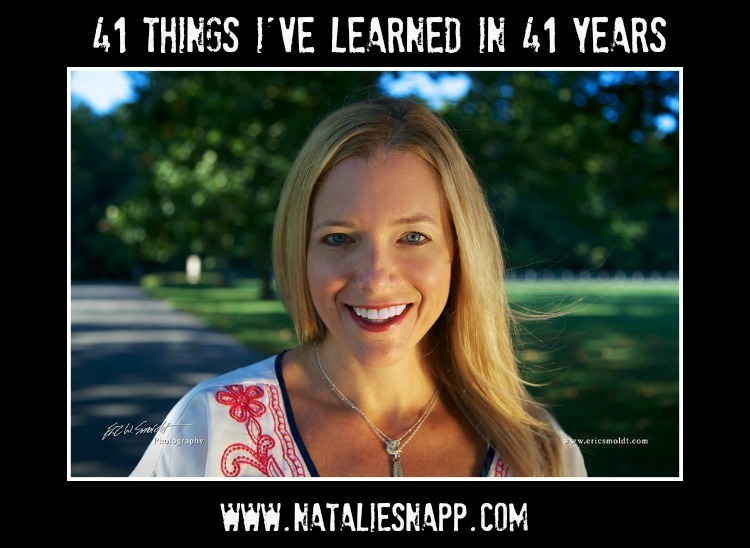 I’m not really sure how it all happened, this turning 40 thing. Last I checked, I was around 22 or so. But according to the math, I should be turning 40 years old today. And yet, I still feel like I am supposed to be forever stuck at 22. In fact, there are moments in which I think “Am I really old enough to have children? Be married?” and I guess, on paper, I am. It’s been quite a journey, as I’m sure yours has been as well. And if the pattern continues, I will likely look back when I turn 50 and say “She knew nothing” because that’s what I’m saying to my 30 year old self of ten years ago. Yet there has been a bit of wisdom attained in the past 40 years. Not a lot. But some. 2. People are disabled by the flesh –including me. They will disappoint me at times and I will disappoint myself. Grace. 3. Dogs have souls. This is not opinion. It’s fact. 4. Ice cream is always worth it. 5. There is not a more precious sound than melodious laughter sprinkled with saltwater and sunburned cheeks. 6. This journey . . . it’s not easy. It’s not supposed to be. But still. It’s hard. If I expect it to always be easy, I step into a self-entitled, downward spiral that’s all about me. 7. Sleep is serious business. The enemy preys on exhaustion. When I prioritize rest, everything else is just a little bit better. 8. Play-dough and glitter are outside toys. 9. Expect insane-in-the-membrane behavior in the home from 3:30 until at least 6 p.m. It’s called “the witching hour” but it’s really more than an hour. And it’s not a myth. 10. It’s really hard to build-up trust again once it’s broken. It’s not impossible but it’s hard. Grace. 11. I can’t always see how He’s working but He’s working–in ways I can’t wrap my little pea-sized, human brain around. Every disappointment I’ve experienced thus far has been followed with an “Oh, now I get it,” months later. 12. Boys chafe at the beach. Cut-out the liner of a swimsuit and stick ’em in compression shorts. Voila. 13. My children hear way more than I think they do and they understand way more than I expect them to. I have to watch-it these days. 14. Music can transport the soul to the past. Good and bad. 15. Regardless of what’s going on, the sun will still rise and set. That’s a constant. Just like He is the same as He was yesterday, today, and tomorrow. 16. Girlfriends are essential to your mental health and they help your marriage. 17. That being said, the sting from broken friendships can last a long time. Grace. 18. It really does all come down to loving our neighbor as ourselves. When I do this, I feel better. There must be something to it. 19. I will forget at least ten things during the day. It’s crowded in there. 20. A gentle answer turns away wrath but a harsh word stirs up anger. 22. The self-fulfilling prophecy is real. If you think the worst of someone, that’s probably what you’ll get. When we think the best of people and give them the benefit of the doubt, we’re walking in alignment with what God calls us to do. 23. When you wash a pull-up or a diaper in the washing machine, it looks like a Rice Krispie treat has exploded and it’s a nightmare to clean-up. Check carefully. 24. Kids get whiny when they’re tired. Stick ’em in water and put ’em to bed. 25. Popsicles have magical healing powers. 26. Jesus is present everywhere – even the places we’ve told Him to leave. He’s in private school, and homeschool, and public school. Whatever choice you make is yours to make and you will make the best one for your child. But don’t judge others who have made a different choice from yours. 27. Planning is a good thing. Over-planning and over-thinking is a control-issue. General outlines are good; rigid, inflexible plans are not so good. Life throws curveballs. 30. There is something to be said for grace and truth. We need a healthy combination of both – too much grace produces an anything goes type of living. Too much truth produces nasty legalism. Balance well. Live by Jesus’ example. 32. Hurting people hurt people. Be nice to them anyway. 34. Grace must exist in a marriage. Must. You will fail each other. You will mess-up at least once a week if not more. You will let each other down, you’ll say things you don’t mean, you’ll at times be astounded by the anger that can rise-up in you at another person. If you go in search of someone else, the same will occur with whoever you find. It’s called marriage and it’s beautiful. And it’s hard. It’s a dance and some days the dance is perfect and others, we just clod along. But the music still plays and we keep choosing to love – even when we’re clodding. 35. That being said, whoever said marriage is 50/50 was on crack. It’s cyclical (and not like the cycle I refer to in number 33). Some seasons you’ll do more, some seasons he will. 36. Keeping score will ruin relationships. 38. Being over-scheduled stresses kids out. It’s not worth it. 39. Never, ever say no to the ice cream truck when it comes through your neighborhood. It’s more about creating the memories than the ice cream. There will be a day when you won’t have anyone in your house who will even care about the ice cream truck. Ride the excitement wave while you can. And see number 4. 40. Jesus breaks through the strongest of chains. I know this for a fact. Redemption is lovely. 41. The world will not end if your children wear the glittery, licensed character shirts you once vowed they would never wear. Happy Birthday, dear readers. I know this might sound weird because it’s my birthday and technically, I’m supposed to be celebrated, right? But you all? You bless my socks way off. So on my birthday, I’m honoring YOU. Happy Birthday, friends. Go chase the ice cream truck. Get Natalie in your inbox! Liked this post? Get more just like it delivered directly to your inbox. It's the best way to stay in touch to these kinds of conversations! Natalie, I so love you! You are real. You know me, and you know the journey I am on right now. (-45 and counting!) Whether or not ice cream is always worth it depends on the ice cream. Fair Oaks? Yeah, worth it. Others? Maybe not. :-) May your next 41 years be richly, wildly, lavishly blessed! Ha! Thank you so much, Anni. I adore you. And yes, OK…I guess there are times when it ISN’T worth it – but Fair Oaks Farm? ALWAYS worth it! Love to you, sweet sister! Amen, Cherie! There are SO many marriage enemies! Thank you for reading and commenting! Happy Birthday! Your blog has been such a blessing to me. There are so many days when I’m troubled over this and that and find your post for the day to be so relevant to whatever is going on. Upon reading I feel more peaceful and re-centered on Him and what is important. Thank you. Thank you so much for the encouragement, Tracey! Yes, peace and re-centering on Him is SO important. I get off-track as well and it’s when I put Him back where He’s supposed to be that I feel best. :) Blessings to you, sweet friend and thank you again for your kind words! 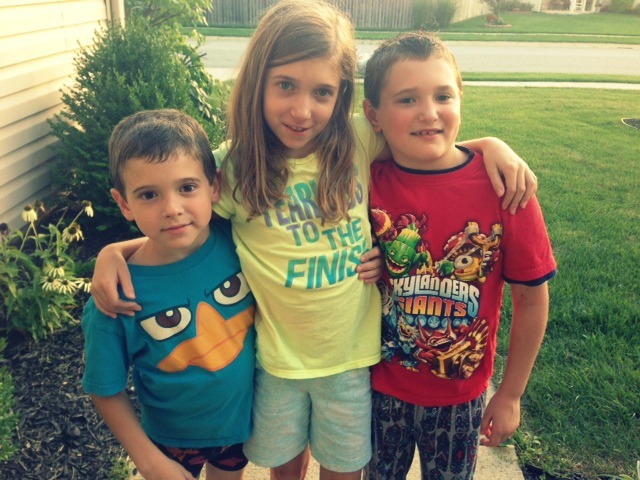 …before you know it they grow out of character tees….it is not cool anymore according to my 10 year old so my 7 year old thinks he can’t wear them anymore either! Can’t believe how fast they grow up! I know, right Jackie? It seems like yesterday when we were getting in to trouble in Lebanon!!!!! HA! I can’t believe how fast THEY grow up and I can’t believe how fast WE grow up…Aren’t we still supposed to be 20?? Love you, girl – thanks for reading and commenting!!!! Happy birthday, Natalie! I LOVE this post! I bet my 17 year old son wishes I’d learned Lesson #12 as early as you did. (I’m 50, and that means he’s been chafing at the beach for many years now!!!) May your year be blessed. Thank you so much, Betsy! The only reason I know that one is because a woman on the beach told me about it…SO thankful for others mothers who can help us all out!!! :) Thank you for reading and commenting, sweet friend! Get emails from Natalie. All the cool kids do. I love hanging out on Instagram! Join me? “My grace is sufficient for you, for my power is made perfect in weakness.” Therefore I will boast all the more gladly about my weaknesses, so that Christ’s power may rest on me. * Friends, I’m in Book Launch Land. I’m feverishly working to prepare for the release of Heart Sisters: Be the Friend You Want to Have. I’ll be re-posting some oldies (but hopefully you’ll think they’re goodies!) now and then so I can focus more on the upcoming release. Thanks for understanding . . . Oh – and I so appreciate you taking the time share on social media. This is the way of the writer these days and will help get the word out about Heart Sisters! A few years ago, I was talking to a woman who was in ..
Last week, I found myself with an unplanned hour and a house of beckoning chores demanding immediate attention. So like any woman with a house full o’ kids and a husband that works long hours, I thought I would just cram as much as I possibly could into those precious 60 minutes. I arrived home, put on my running shoes and started to RUN throughout the house, checking this and that off my list. A few minutes into my Wonder Woman mission, I grabbed a load of dirty towels and, clutching my phone in my right hand, loaded them in .. I know, I know . . . Who wants to raise an anxious child? Who would ever read such a post? Of course, none of us intentionally tries to raise a child prone to anxiety and stress. But many of us are. Myself included. I’m not preaching to you from the pulpit – I’m talking to you as a friend sitting with you in the same boat. And at times it feels like we’re wearing life preservers and praying for rescue, doesn’t it? The more I think about this though, the more I realize that perhaps parenting is really not .. If you’ve been hurt by the church, then it’s likely the thought of ever going back to church again is right up there with oh, say getting your teeth pulled (sorry, Honey.) (My husband’s a dentist. I have to watch dental jokes and comparisons.). I need to confess I once felt the same. Honestly, when those wounds were still raw, the thought of ever stepping foot inside another church again was enough to make me physically ill. We (Jason and I) talked it over incessantly. “Maybe we could just follow Jesus and just not go to church?” we asked each ..
We sat contemplatively around the table, speaking softly about the struggles of marriage. I complimented her on her courage because for some reason, we feel shame when we admit our marriage is in trouble. I know because I’ve been there and felt it, too. I begin to share some of my own heart and experiences with my ten year old marriage, wisdom attained through the really hard places. Unfinished wisdom that still percolates and wisdom I know but don’t always allow my actions and choices to show it. I then share some heart changes I had to make in order ..